Waterproof Outdoor 13A 2 Gang Switched Socket Double IP66. 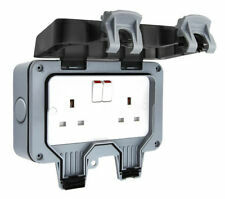 The Double Pole 2 Gang 13 amp Switch Socket is IP66 rated for protection against water ingress. It has a robust, high impact UV stable switch housing for protection and safety. 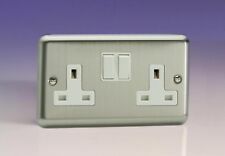 This premium range is finished with a light lacquer to resist fingerprint smudges and has no visible plastic around the switches. Lightly lacquered surface to reduce fingerprint marks. Standard 13 Amp Socket. Lightly lacquered surface to reduce fingerprint marks. Modern slim profile with. nd Class signed for. Double Wall Socket 2 Gang Plug 13A with 3 USB Port Charger Outlets White Plate -Dimension: 146*86*35mm -N.W. : 165g/Unit -Color: White -Metal: Phosphor Bronze -Plastic: Flame Retardant PC Plastic -Input Voltage: 110~250V/50/60Hz -Input Current: 13A -USB Output: 5V/3000mA -USB Ports: Dual -Application: All Smart Devices builds in USB Power supply Inflaming retarding material with UL94V0 fire-protection rating -The design of USB Power based on surge/lightning/over-voltage and over-current protection. Features: -Thick copper phosphate conductive carrier, good elasticity, low temperature, the use of more secure 3 USB ports,universal use -Each AC port is equipped with a separate switch, USB port also with a separate switch，no need to pull out the plug. Genuine MK Product. 13AMP 250V 2 GANG. Double Pole Switched Socket. Screwed Face Plate (provided). 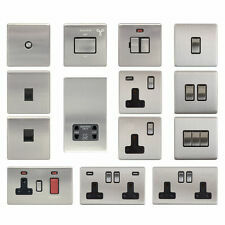 Rose Pink Lily Range - Light Switches, TV & Plug Sockets, Fused Spurs & More! A High Quality 13 Amp Single Wall Socket Switched that Fits into Standard Back Boxes. 1 x White Double 13 Amp Single Wall Socket Switched. Switched with red on indicator. 13 Amp Rated. Features: Made by fireproof PC material, high temperature resistant and safe to use. Conductive carrier is used thick copper for good conductivity. Easy to install and easy to use, power saving. With UK plug so you can use it anywhere、anytime and easy to install. 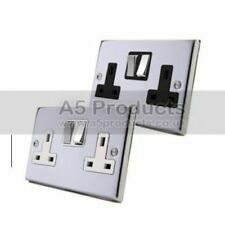 Perfect for homes, offices and work places with a limited amount of wall plate. Description: 1.Build in intelligent USB charger compatible with most 5V digital products. 2.Support fast charge mode, build-in high efficiency charging control IC, multiple protection circuit device. 3.AC circuit ,DC circuit run separately ,independently of each phase. 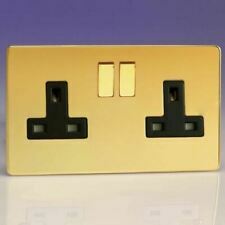 4.Approval by CE and ROHS..
1 x Gang Twin Plug socket. 2 Gang Twin Socket Back Box. 1 x 25mm Patters Back Box. Input Current: 13A. 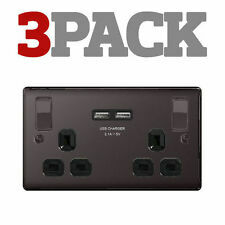 -Double 2 Gang wall Socket. -USB Ports: 3 ports. -Thick copper phosphate conductive carrier, good elasticity, low temperature, the use of more secure 3 USB ports,universal use. 1 x Dual Wall Socket mount Screws. 2 Gang Metal Clad Double Switched USB 2.1A Socket Power Shed Garage Workshop. Twin Switch Socket with Built in USB Charging Ports. 2.1A 5V USB 2.0 Type A (either one or split across two ports). Caravan Accessories. 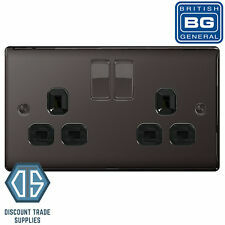 100 Twin Double Switched Socket White 13amp Plug 2 Gang. 50X Twin Double Switched Socket White 13amp Plug 2 Gang. 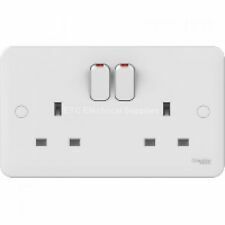 Twin Double Switched Socket White 13amp Plug 2 Gang 240. DOUBLE SOCKET & 25MM BACKBOXC/W FIXING & SCREWS. Fire Alarm Cable. Reflector Bulbs. 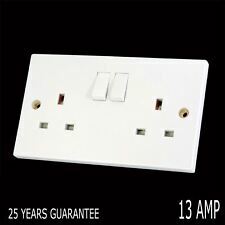 2 Gang Twin Double Switched Socket White 13amp Wall Plug Socket Square Edge SP. 16X Twin Double Switched Socket White 13amp Plug 2 Gang. 50X Twin Double Switched Socket White 13amp Plug 2 Gang.